Police fired tear gas to disperse protesters in al-Hoceima, northern Morocco, on Thursday. Demonstrations have been continuing in the port city for months in spite of a government crackdown. They were triggered by the gruesome death of a fishmonger. 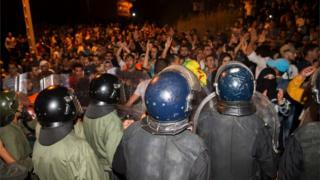 BBC Arabic's Amir Rawash examines why these protests have managed to keep their momentum. Thousands of Moroccans took to the streets in a number of cities last October when a fish-seller was crushed to death in a garbage truck. Mouhcine Fikri was trying to rescue his stock, which the police wanted to confiscate. This incident was reminiscent of the suicide of Tunisian street vendor Mohamed Bouazizi, which became a catalyst for the so-called Arab spring. His death - after the authorities had taken his goods - also sparked a wave of protests. Al-Hoceima witnessed demonstrations in 2011, inspired by uprisings in other Arab countries. Anti-government protests were called by some activists last October to protest against the death of Fikri. As the demonstrations have snowballed, corruption and unemployment became central topics for the angry movement. Whilst the government is the subject of much criticism, there have been no protests against King Mohammed VI . The demonstrators are also calling for the release of detainees, including well-known activist Naser Zefzafi, who is deemed the leader of the so-called al-Hirak al-Shabi (Popular Movement). Why did demonstrations in Rif maintain momentum? Inhabitants of the Rif region, which has a largely ethnic Berber population, have felt neglected by the central government in Rabat for many years. They have become increasingly vocal about their longstanding grievances, which include poor living conditions and marginalisation. The government has recently pledged to implement major development projects in Rif. However, continuing demonstrations show that there is little trust in these promises. The Moroccan government sought to control the widespread resentment following Fikri's death. King Mohammed ordered officials to visit al-Hoceima to calm the angry crowds. As the protests gained momentum, the authorities opted to crack down on them. Scores of protesters have been arrested. Tear gas was used to disperse protesters. Activist Naser Zefzafi was accused of "threatening national security". "The state had no choice but to enforce the law," Morocco's Interior Minister Abdelouafi Laftit has been quoted as saying, defending the government's action. However, human rights groups have voiced concerns about the arrests. "We fear this wave of arrests may be a deliberate attempt to punish protesters in Rif for months of peaceful dissent," Heba Morayef, North Africa Research Director for Amnesty International warned.